What is a lawn greeting? 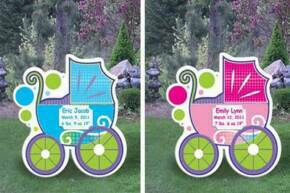 A lawn greeting sign rental is a fun new way to celebrate a special event and it makes a more memorable gift than a traditional card, gift, or flowers. Special occasion yard sign displays are placed in the recipient's front yard prior to 6:00 am to greet them with a surprise before they begin their day! See our FAQs for more details. Smiling flowers are sure to put a put a smile on their face! Reserve now to ensure availability. As seen on the Charlotte Today show! Great for any occasion! Welcome Home, Thank You, Good Luck, Congrats, Last Chemo Day, Get Well, Retirement and More! Happy Sign Surprise now serves the Greensboro, NC area!